If you want your teeth and gums to stay healthy, the most important thing to do is to make sure that dental plaque does not remain on your teeth for any amount of time. At our periodontal practice, Advanced Periodontal Services, PC, our Sheepshead Bay dentist can give you oral hygiene instructions so that you will be able to remove the most amount of dental plaque from your teeth during your at-home teeth cleaning regimen; our two top-notch dentists are Dr. Selgenick and Dr. Mantzikos. Dental plaque is a substance which naturally forms in your mouth on a continuous basis. It is actually a clear and colorless film which is extremely sticky. The dental plaque contains many different types of bacteria and acids which will cause problems for your teeth if it is left to work on your teeth. The acids in dental plaque will attempt to eat through your tooth enamel and cause dental cavities. By brushing and flossing your teeth at home on a regular basis, you should be able to remove most of the dental plaque so that your teeth will remain healthy. If plaque stays on teeth for even a short amount of time, tartar will form. Tartar is a hard and mineralized substance which tightly adheres to teeth and can only be removed from teeth with dental cleaning instruments. Since no at-home teeth cleaning regimen can ensure that all plaque is removed, it is recommended that patients have a professional teeth cleaning every six months to remove all tartar and plaque from your teeth. When tartar stays on teeth, it encourages the development of deep pockets to form between your teeth and gums. Plaque, tartar, bacteria, and food debris will all gather in these deep pockets and you will develop gum disease. When this is the case, you will need to come to our periodontal practice for a scaling and root planing treatment, by our Sheepshead Bay dentist, to help your gums return to good health. 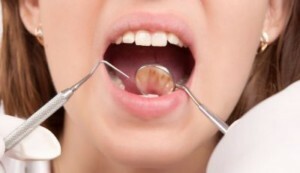 For an appointment to see our Sheepshead Bay dentist for excellent gum care, contact us today.